During the first 6 months of 2017, 285 scientific papers have already been published that cast doubt on the position that anthropogenic CO2 emissions function as the climate’s fundamental control knob…or that otherwise question the efficacy of climate models or the related “consensus” positions commonly endorsed by policymakers and mainstream media. These 285 new papers support the position that there are significant limitations and uncertainties inherent in our understanding of climate and climate changes. Climate science is not settled. Natural factors such as the Sun (84 papers), multi-decadal oceanic-atmospheric oscillations such as the NAO, AMO/PDO, ENSO (31 papers), decadal-scale cloud cover variations, and internal variability in general have exerted a significant influence on weather and climate changes during both the past and present. Detecting a clear anthropogenic forcing signal amidst the noise of unforced natural variability may therefore be difficult. It should be noted that the rate of inclusion on this year’s “Skeptic Papers” list at the halfway point is slightly ahead of last year’s pace. That’s because in 2016 there were 500 peer-reviewed scientific papers published in scholarly journals (Part 1, Part 2, Part 3) challenging “consensus” climate science. Below are the two links to the list of 285 papers as well as the guideline for the lists’ categorization. (Parts 1 and 2 are on the same page). Nice compilation, Kenneth. Is certainly most inconvenient to the alarmists and bureaucrats who are in a hurry to impose centralized rule. Yes the AGW argument is wounded, in some places badly. However the unthinking advocates of the UN-IPCC and their profiteers will bleat on endlessly about their non-validated, non-verified models proving the unprovable. At lease one, I predict, will turn-up here soon to rant on as if scientific investigations of this planet’s climate thus far are utterly settled. These people ‘know’ that their ‘facts’ are immutable and can not be reinterpreted in any other way, no matter how illogical, than that by which they have been tutored. It’s truly sad to witness such closed minds, but that’s people for you. Jun 15, 2017 HAHA!!! GLOBAL WARMING STUDY CANCELED, THE REASON WILL HAVE YOU ROLLING ON THE FLOOR LAUGHING!!! American Lookout reports, In a perfect example of irony, a scientific research study that intended to study global warming was cancelled after encountering large amounts of ice. Now were is that definite linkage between perceived short term global temperatures (homogenized averages) and local climate effects on the ground. Ummm, they don’t look to apparent currently. As we all now know, there is absolutely no PROVEN downside to enhanced atmospheric CO2. The mercury in the NSW town of Deniliquin , close to the Murray River, sank to -5.6C early on Sunday morning. … that’s the coldest it’s been for 110 years. I thought it was cold on the NSW coast, but apparent the whole state and most of Victoria copped record breaking cold. Cool picture on this page. Ice grass !! look further down too. other pics, that dripping tap is pretty cool. ! unfortunately the supposed warm planet does not often equate to the weather or climate playing along. a) If land based (or land and sea) temperature monitoring system, then the stations are too sparse, too homogenized and have too big a separation between them to properly reflect regional (local) climate effects. b) If satellite based then the overall average is diluted by the massive amount of water. Water that skews the readings away from land based climate effects. However it is consistently more reflective of true temperatures as measured by weather balloons, etc. Therefore no matter which way you cut it, global (massively averaged) temperatures do not reflect the climate that matters — the climate affecting people. A climate effect are regional (and so local), it is never global. If all this monitoring is not reflecting what the regions’ climate is doing, what affects the people paying for it, why keep funding it? The satellites tells us more than enough about global temperature, terrestrial monitoring is a joke system, with all its unwarranted adjustments and faked data, also it employs too many climate change advocates — just sack them all. WOW!!!!! BOM erases cold record. “2 July 2017 – Hikers taking the 6km round-trip trek up to Bluff Knoll, in Western Australia’s Great Southern region, found the peak of the Stirling Range snow-capped on Sunday morning. Bluff Knoll, the third highest peak in WA, stands 1095m (3592 ft) above sea level. It is one of the few places in the state where it can actually snow on the rare occasion. What a great service it is to compile this list and offer it. The number one challenge that global warming skeptics face when debating in public is dealing with the closed -mind argument that “the science is settled”. Of course it is not. Someone would do an almost as useful service by beginning to compile a list of the academic papers that call into question the merits of the emission reduction policies now being promoted – the endless list of regulations, subsidies, taxes, product mandates, and government-imposed “information programs” that all seek to alter energy supply and demand decisions. There certainly are a large number of those as well. “how it is supposed to work” = according to non-real-world theoretical models that say CO2 molecules that are spaced together 1/20,000ths more closely today than they were in 1990 function just like a blanket draped over the ocean waters, and this CO2 blanket determines the net heat changes in the depths of the ocean more so than variations in direct shortwave radiation absorption does. Never mind that we have no real-world observations or physical measurements or controlled scientific experiments verifying “how it is supposed to work”. Just believe it’s true…and it becomes so. None of us have declared defeat, SebastianH. It’s quite amusing that you think you’re “winning” here by peddling your beliefs. Until now you couldn’t describe how that greenhouse effect works or more specifically how backradiation is supposed to warm (or increase heat content of) the surface. Whenever you write something about this topic it becomes very clear that you don’t understand the effect. If that is not true, please demonstrate by describing how backradiation is supposed to cause warming. In you own words … not a quote from some paper. Thank you. Just believe it’s true…and it becomes so. It doesn’t matter that I think backradiation exists and the greenhouse effect is real. My remark was about most skeptics not understanding what they are trying to refute. It’s not that complicated to understand and you don’t have to accept it being true in order to understand it. More CO2 in the atmosphere causes the skin layer of the ocean to heat up more than it otherwise would. The skin layer temperature gradient determines how much ocean heat is lost to space, as the lower the gradient, less heat is lost (or lost less rapidly). With more CO2, more heat is trapped, or radiated back to the surface and prevented from escaping to space. CO2 concentrations act more or less like a blanket, or the glass in a greenhouse, determining how much heat is lost. CO2 doesn’t heat the ocean itself, it prevents cooling with higher and higher concentrations via changing the temperature gradient of the skin layer. In this way, the skin layer is the main player in ocean heating/cooling. 1. Shortwave radiation largely determines the temperature of the skin layer, not CO2. Shortwave radiation modulators such as clouds and aerosols (albedo) are the dominant determinants of how much heat is absorbed by the oceans. 2. The temperature gradient of the skin layer affected by GHG backradiation is just 0.002 K (according to RealClimate.org) at most, which is not enough of an induced heat change to be a determinant of ocean temperatures. The skin itself cools by about 0.3 or 0.4 K due to radiative fluxes at the skin surface, which is a change that is two orders of magnitude greater than the alleged heat change in the skin layer induced by GHGs. 3. CO2 molecules are not densely spaced enough to function anything like a blanket or glass when it comes to determining water temperatures. Since 1990, CO2 concentrations have risen by 50 ppm. This means CO2 molecules are today spaced together 1/20,000ths more closely than they were 27 years ago. That’s imperceptible when it comes to heating the ocean, as it takes 1,100 more heat energy to heat the oceans than it takes to heat the air…and the heat flux goes from ocean to atmosphere. CO2 concentration changes are easily overwhelmed by changes in other factors that affect longwave and shortwave. 5. Both the CO2 reconstructions and temperature reconstructions of past atmospheric/climate changes do not support CO2 as a dominant driver in either. CO2 rose as temperatures dropped, and CO2 fell or remained trendless as temperatures rose. I can think of several more, but I’ll leave it at that for now. I am not claiming that you don’t understand something because of just one word. You managed to describe the greenhouse effect and yet your list of problems demonstrate that you don’t seem to understand the mechanism (and other mechanisms too). 1) SW radiation has heated the surface for a very long time. Long enough that the heat content is what it is today and high enough so all incoming energy gets radiated, evaporated and conducted away. What changes the heat content in such a system is not the magnitude of SW radiation, but the changes (you wrote clouds and aerosols). The resulting forcings aren’t magnitudes higher than CO2 forcing and do not cancel out or overhelm the latter one. You will probably quote some papers on this topic with the -21 W/m² forcing of clouds without mentioning that this is the total forcing of a cloud and not the forcing that results from a change in cloud cover from one percentage to another. 2) I don’t know if that 0.002 K figure is correct or where exactly it is coming from. What I do know is that the figures you mention that are magnitudes greater are (similar to problem 1) the result of the current heat content / temperature of the oceans and not of a forcing from something that changed the amount of SW radiation reaching the surface. The question is how much do you 0.3 to 0.4 K change if cloud forcing of 0.5 W/m² by a reduced cloud cover is applied. You see the problem with those two “problems” of yours? You compare (as with CO2 increase caused by humans) two different effects with each other and claim that one is magnitudes higher. 3) The term “blanket” is normally used to illustrate the insulation effect not warming by contact from a warm blanket to the cold ocean. The greenhouse effect isn’t warming the atmosphere which then in turn warms the oceans/surface. That’s not what your (copied?) description of the effect says and arguing against it like this just shows that you didn’t understand it, sorry. It’s not about one word being wrong, it’s about you not getting the concept. 4) To make it absolutely clear: increased backradiation from any source results in an imbalance between the “energy in” and “energy out” fluxes. Whether or not increased backradiation from an increased CO2 concentration causes the heat content (of a body of water) to increase, is determined by how much of that “energy in” flux gets converted into energy out flux in form of evaporation, etc. From your comments that is not always entirely clear as you seem to argue against the imbalance itself (which is indeed basic physics). Lately you quote a paper by someone named Irvine, trying to show that all backradiation change is converted into evaporation (which his experiment clearly is unable to demonstrate). Same goes for the windy conditions you mention. Does more backradiation cause more wind? 5) If you’d understand how CO2 concentration changes with temperature changes and how it depends on the CO2 concentration itself (e.g. it’s not a linear system) you’d know that falling CO2 concentration can occur while temperature rises and vice versa. That one is an obvious misunderstanding by you. As I’ve probably written 3 dozen times, it comes from RealClimate.org…in a blog post written by Peter Minnett. He obtained it from an experiment using clouds as a proxy for CO2, which are, as mentioned above far more influential than CO2 concentration changes in determining LW forcing parameters. So the proxy used in the experiment yielded a much larger perturbation in the skin layer than could be accomplished by CO2, and that perturbation still only amounted to 0.002 K! (Sigh) No, I didn’t write that. But, as expected, that doesn’t stop you from making up something I wrote/thought and then saying “It’s not about one word being wrong, it’s about you not getting the concept.” Your sophomoric debate tactic was employed exactly as I had predicted. This is why “debating” with you is often pointless. You just make up stuff. It is also straightforward to show that a 1.7 W.m-2 increase in downward LWIR flux at the ocean surface cannot change ocean temperatures. Water is almost completely opaque to LWIR radiation. The LWIR absorption/emission depth is less than 1 mm, so the interaction volume is at most 10 cm3. An increase in downward LWIR flux at the ocean surface of 1.7 W.m-2 heats the surface layer at a rate of at least 2.4 C per minute. The ocean responds by rapidly increasing the surface evaporation rate by 1.7 W.m-2, or 2.7 g.hr-1 of water for ideal ‘clear sky’ conditions. This corresponds to a 2.4 cm.yr-1 increase in evaporation rate since 1800, with 1.7 cm.yr-1 of this increase occurring over the last 50 years. Global estimates of ocean evaporation rates show that between 1977 and 2003 the global ocean evaporation rate has increased from 103 to 114 cm.yr-1 with an uncertainty of ±2.72 cm.yr-1. This was caused by a 0.1 m.s-1 increase in average wind speed. The ‘clear sky’ upper limit for the CO2 induced increase in evaporation is below the measurement uncertainty bounds. … The increase in flux is converted by the ocean surface into an insignificant change in evaporation rate. This is buried in the noise of wind induced fluctuations in evaporation and changes in LWIR flux caused by variations in aerosols, clouds and near surface humidity. No, it about you not having a single bit of scientific proof to back you your anti-science AGW belief. You obviously DO NOT understand the basic physics of what actually DOES happen, so you have to come up with these wildly erroneous , imaginary concepts. Your understanding of basically every point K is making is stilted and bent and warped by your deep-seated anti-knowledge and your manic, unsupportable belief in the anti-science AGW religion. Your arguments are totally incoherent and illogical, and you don’t even seem to realise it. It’s not about one word being wrong… its that basically EVERYTHING your say is diametrically opposed to scientific reality. A mindlessly yapping dement chihuahua would make more scientific sense. As you have continually shown, there is ZERO evidence that CO2 causes warming in a convective atmosphere or of oceans. There is NO such thing as CO2 forcing. CO2 does not emit below about 11km, and it DOES not force anything, it is purely just another channel for surface cooling. IN the lower atmosphere, the thermalisation to the other 99.96% of the atmosphere is MAGNITUDES faster than the emission release. Your continued WILFUL IGNORANCE of the basic physics involved, really does show how little you prepared to actually try to learn anything other than your brain-washed AGW mantra. AndyG55, it is really hard to ignore what you write. No substance, only whining and ranting and false claims. Why are you doing this? Do you really don’t know any better? Or are you trying to troll AGW proponents? Poor seb, why can’t you stick to FACTS instead of your baseless unproven AGW mantra. but you just keep on with the MANIC TROLLING. It really must be a pitiful existence you live. You really are a sick-minded little cretin, aren’t you seb. You know that the ONLY reason you come here is to troll with your baseless AGW mantra.. and then you accuse others. You really do need to look in the mirror, and GET A LIFE, seb. What you are currently doing isn’t a fit life, even for a tape worm. Maybe my understanding of the English language is really poor, but with this you are saying that is impossible for the atmosphere to heat the ocean and to emphasize that you mention the heat flux. My statement “the greenhouse effect isn’t warming the atmosphere which then, in turn, warms the oceans/surface.” is a reply to that. Apparently you think that is how the greenhouse effect works. If not, then you shouldn’t use this as an argument against it. What you are claiming here is that it could be possible that wind could cancel out CO2 forcing. It’s a valid question to ask you: “Does more backradiation cause more wind?” Why? Because that is what would have to happen. The existence of wind alone doesn’t cancel any increased backradiation effect, it would have to increase accordingly. So … does it do that? And you first three quotes are the perfect example of you problem with comparisons, e.g. changing cloud conditions may cause 100 W/m² infrared forcing, but they also block SW and I am sure you have a links ready to several papers that mention the net forcing of clouds is around -21 W/m². And that’s the forcing of all clouds at a certain percentage of coverage. To be able to compare it to a global forcing of 4 W/m² caused by a doubling of the CO2 concentration, you have to convert those -21 W/m² into a global forcing too. If cloud cover changed from 70% to 69% the forcing would change from -21 W/m² to -20.7 W/m² … that’s a positive forcing caused by cloud cover reduction of 0.3 W/m² and that figure is the one that you can compare to CO2 forcing values. Got it? No, I don’t use words like “impossible”. As a skeptic, I don’t shut the door to possibilities. And no, I didn’t write that. Why not just use words I actually write instead of making up your own wording? This is exactly what I expect from you. Make up your own words, dishonestly claim I wrote them, and then claim that this means I don’t understand “how the greenhouse effect works”. Does it ever stop? Are you perpetually this dishonest in your personal life too? I never talked about wind from the “backradiation effect” – you did. I talked about wind as it relates to the SKIN layer. The skin layer is where the CO2/backradiation effect allegedly has its impact on determining the heat content of the ocean. Increased wind/turbulence/wave breaking destroys the skin layer. This is common knowledge. You continue to demonstrate that you really don’t understand how surface solar radiation/cloud radiative forcing works. I have found that it is pointless to try to explain it to someone who is committed to not understanding it. I won’t take the time again. It’s not like anyone here is relying on you for insight. You continue to demonstrate that you really don’t understand how surface solar radiation/cloud radiative forcing works. Do you honestly think that when a paper/website you quote writes that clouds cause 100 W/m² LW forcing or -21 W/m² net forcing that this is the forcing when cloud cover changes by a small percentage? By using those “big numbers” and comparing them to CO2 forcing you are – once again – comparing apples to pears. It’s essentially the same thing when you quote “In round numbers, the temperature increase produced by a 2 W.m^-2 increase in LWIR flux from CO2 is overwhelmed by a 50 ± 50 W.m^-2 flux of cold water and a 0 to 1000 W.m^-2 solar heating flux. Over the tropical warm pool the wind driven cooling rate is about 40 W.m^-2.m.s^-1” . Do these numbers change in response to more backradiation? If not, then the CO2 forcing is not overwhelmed or canceled out by them. Until you stop making those ridiculous comparisons and claims I won’t buy your “As a skeptic, I don’t shut the door to possibilities” defense. You have a strong opinion about the influence of mankind and bend every argument to support that, even if it’s a mathematical impossibility. No. Once again this very question (using made-up thoughts that I’ve never expressed and dishonestly attributing them to me) is further affirmation that you don’t know how surface solar radiation or cloud radiative forcing works. Again, it is not worth my time to try to teach you (again). You have ZERO science on your side. Enhanced atmospheric CO2 is absolutely and complete BENEFICIAL..
.. so stop your mindless troll-like yapping. CO2 does not emit below 11km. This “forcing” is a myth, and AGW lie, that you have been GULLINBLE enough to swallow and choke on. CO2 is a radiative gas that absorbs a thin slice of out-going radiation and, since re-emission time is magnitudes more than collision time, thermalises that energy to the remaining 99.96% of the atmosphere. Convection then does the rest. There is absolutely NO mechanism whereby CO2 can cause warming of the convective atmosphere or of water, or of anything else. Back to back radiation sensors near the ocean surface nearly always show an outward flux. Why do you continue to refuse to learn basic physics, seb. It seems that you WANT to remain wilfully ignorant. … and that all you are doing is your continued a low-level troll act. What a sad life you must lead. !!! From what I see it is your poor understanding of the role scientific models play in science that is the problem. You have a belief (for that is all you have) that models provide certainty where none really exist. Climate models are only poor approximations of reality. They only provide possibilities and probabilities; observations and the correct interpretation of it provides reality and sources of new scientific inquiry. Levels of confidence in modeled outcomes amount to zero when they do not reflect reality, and the reality is CO2 appears not to heat the atmosphere at the tropospheric level. Your failure to see this is not our failure it is yours. and the reality is CO2 appears not to heat the atmosphere at the tropospheric level. No, that’s not reality … well, maybe yours. You have a belief (for that is all you have) that models provide certainty where none really exist. There is a difference between a model that tries to predict future average temperatures and a model that describes how sea surface temperature changes cause CO2 concentration changes and depend on the current CO2 concentration. Its is a UNPROVEN load of claptrap. CO2 DOES NOT have any affect whatsoever on ocean temperatures. You have proven time and time again that CO2 warming of oceans is a MYTH, backed by anti-science and your monumental ignorance of the effect of a SW on water surfaces. Your childish yapping has shown that you have chosen to remain, as always..
No, that is everyone’s’ reality — you admitting not being able to understand it, is your problem. Oh and your tangled sophistry about the use of models. Normally in science models are only tools to help make sense of observed reality. In real science (and most engineering technology), models are checked against reality. However climate models fail to reflect reality, even at the most basic level. Therefore they MUST be wrong as reality never lies. About 2000 years ago, there was a Roman Warm Period and then it got cold. About 1000 years ago, there was a Medieval Warm Period and then it got cold. That was the Little Ice Age. When Oceans are warm, Polar Oceans thaw, snowfall increases and rebuilds ice on Greenland, Antarctic and Mountain Glaciers. Ice builds, spreads and makes earth cold again. Snowfall decreases and the Sun removes ice every year until it gets warm again. It is warm again now because it is supposed to be warm now. It is a natural cycle and we did not cause it. CO2 just makes green things grow better, while using less water. So seb get over it, there is no catastrophic warming coming just because CO2, a rare atmospheric gas has NATURALLY risen by an inconsequential amount. Unless of course, YOU know at what level CO2 should be now and can show that the CO2 rise is unnatural. Good luck with that. How far away from CMIP5 models do you think the current temperature is? I guess we will see if that is true, reality never lies, right? Do you have any evidence of this being a purely natural cycle? CO2 is an LW radiation absorbing gas. Increasing the concentration in the atmosphere causes a forcing. Are you saying there is a negative feedback that cancels any additional CO2 forcing? Or are you saying that you think CO2 doesn’t do anything? Why do you call it catastrophic? I certainly didn’t. And why do you use future tense? Warming is already happening. 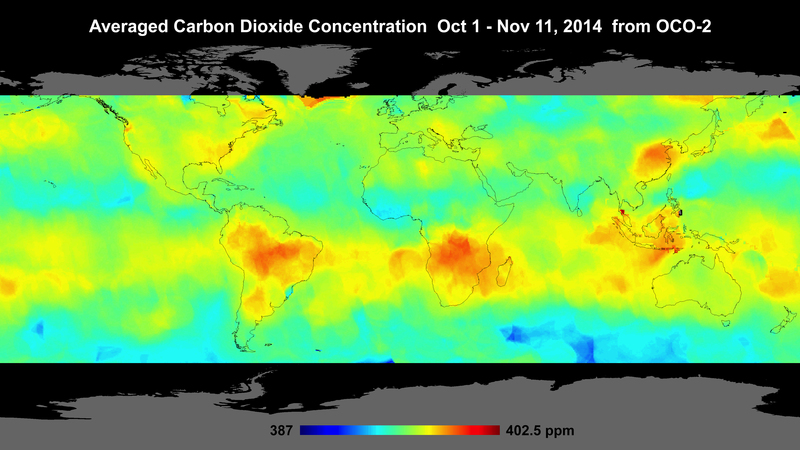 just because CO2, a rare atmospheric gas has NATURALLY risen by an inconsequential amount. It hasn’t naturally risen by that amount and the amount isn’t small compared to reconstructed concentration data from the Holocene. Unless of course, YOU know at what level CO2 should be now and can show that the CO2 rise is unnatural. Good luck with that. Where should it be now? You mean without human emissions? That is difficult to tell, but with the modest increase in temperature, it would still be somewhere in the vicinity of 300 ppm and not 400 ppm. CO2 increase is 100% caused by humans. There is just no way that almost all of our emissions get absorbed by nature (it’s just about half of what we emit) and natural variability being able to supply as much CO2 as we emitted in return. Even if nature would do something like that, would that mechanism continue to match our output when we stop emitting CO2? How doesn’t “know” that we stopped? No, this makes no sense at all. Still the same old UNPROVABLE RUBBISH statement, that goes against all know science. Prove it. YOu have been WOEFULLY ABSENT with any sort of proof. CO2 DOES NOT cause warming in a convective atmosphere, or of oceans. Why do you keep up your mindless, anti-science yapping on something you know you have ZERO PROOF for.? You are just being a moronic AGW troll, yet again, aren’t you. !! That is you ONLY reason for being here. As for the NASA “flat Earth” MODEL. Also if you run it right to the end, all that NH CO2 magically disappears.. industry must have shut down for the winter, I guess. ;-). And YET AGAIN, I will ask the unanswered question..
Name any PROVABLE drawbacks to any level of atmospheric CO2 that we are ever likely to reach…. You are still EMPTY , seb. ! I don’t guess like you do. It’s paywalled and the abstract isn’t particularly enlightening. Download the CMIP5 data and compare it to the GISS or RSS temperature record. You’ll find not much difference. No! You are wrong or at least arguing from ignorance. We have NO method of knowing, it is outside our control. Nature can (and does) put such things at any level required, with or without us. Just because we as sentient beings can understand abstract things does not means we are in control of them. The ignorance is strong on your side. You mentioned Henry’s law in another comment. Do you think there is some mechanism at play that completely overrides this law despite CO2 concentration actually following it quite perfectly? Why do people still think that our rather large emissions contribute little to nothing to the CO2 concentration increase? There is zero evidence for that claim. All evidence points to us. Of course, it could be possible that there is some yet undiscovered mechanism that only absorbs human CO2 (otherwise it would absorb natural CO2 in the absence of our emissions) and some other mechanism that caused a great imbalance in natural sources/sinks causing the increase without a corresponding temperature change. Just a poor EMPTY-MINDED little troll. AHHHH.. so all the CO2 is coming from the oceans.. Your feet must be very tasty for you to keep them permanently in your gob. ! Seawater chemistry? Go find out. As you are rude enough not to even reference what I wrote but instead make up a straw man argument, I can not be bother to answer you. You obviously do not understand the basics of asking a questions and reading and understanding any answers given. Your behavior is that of a spoiled child realizing his foolish efforts of trying to deceive has been found out. Because you have no sense of perspective. Your belief in “our rather large emissions contribute” is nonsense compared to nature. Kenneth has shown you time and again. YOU have decided not to take this reality on board — that is your problem, your ignorance. Read the Butman paper I refereed you to. Because you have no sense of perspective. Your belief in “our rather large emissions contribute” is nonsense compared to nature. Kenneth has shown you time and again. YOU have decided not to take this reality on board — that is your problem, your ignorance. I am well aware of the reality that natural source and sinks are magnitudes larger than human emissions. That doesn’t change that human emissions are large compared to the increase of the CO2 concentration and the natural variability (temperature dependence) displayed in the fluctuations of that increase. I am also pretty confident that there is no magic mechanism that is able to detect human CO2 and just absorb those molecules. That’s the only possibility how human emissions are not responsible for the concentration increase, isn’t it? Because if the atmospheric CO2 content increases by ~5 GtC in a year caused by natural variability and we subtract 10 GtC of human CO2, we end up with a decrease. Unless the mechanism that previously absorbed those 10 GtC stops working with the disappearance of all human emissions. Year-to-year human emission increases only amount to less than +0.2 GtC per year during 2006-2014…and there has been no increase in the rate of human emission for the last 4 years. Despite these tiny rates of year-to-year increase (and flat emissions rates for 4 straight years), CO2 concentrations have risen by about 25 ppm since 2006. This strongly suggests that most of the increase has come from a positive imbalance between natural sources (which out-ratio human emissions by a factor of 24 at least) and natural sinks. …and thus it is only an assumption based on models (i.e., the idea that oceans are a net sink is based upon modeling, not observations) that the tiny changes in human emissions from year to year are driving the atmospheric CO2 concentration changes. SebastianH believes that it is unnecessary to know how much natural emissions change vs. natural sinks change from year to year. All he believes we need to know is how much humans emit per year and the Mauna Loa value…and we can then conclude that we know with certainty that 100% of the CO2 increase is caused by humans. He doesn’t need the complete data to affirm his presupposed beliefs, just as he doesn’t need experimental evidence or physical measurements or real-world observations to affirm his belief that humans are heating up the oceans with their CO2 emissions. His beliefs are enough. There is also no magic mechanism that is able to detect natural CO2 emissions and just absorb those molecules, while simultaneously not absorbing the tiny amount of year-to-year increases in human emissions (+0.2 GtC per year). His beliefs are ALL HE HAS. So far he is EMPTY on just about every other front. A HUSK full of anti-CO2 angst. Yet that CO2 supports his whole life, from his food, to his inner-city basement and it heating, to his Mercedes. His HATRED of CO2 is scientifically and emotionally IRRATIONAL. !! And he can’t even give a reason why. Kenneth, you are still making the same mistake and compare amounts with different units. 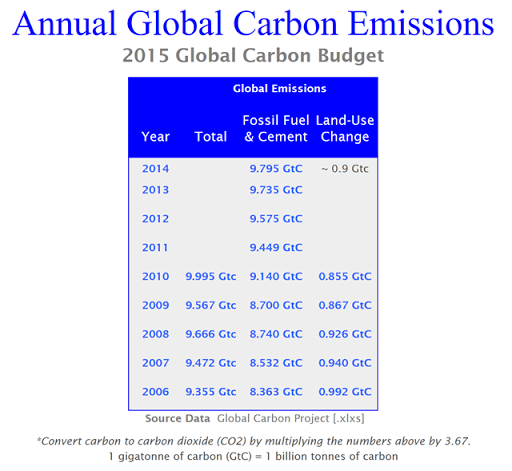 It’s not the increase of human emissions that causes an increase in atmospheric CO2 content! How often does this need to be repeated until you let a friend you trust explain to you why this is wrong? You won’t find this kind of comparison in any scientific paper and I really don’t know why you insist on doing it. What you are effectively saying is: because the car doesn’t increase its acceleration anymore (=constant acceleration from now on) and the speed still increases, it can’t be the acceleration that causes those increases of the speed. SebastianH believes that it is unnecessary to know how much natural emissions change vs. natural sinks change from year to year. Why would there be such a “magic mechanism”? That would only be required if you insist on natural sources currently being larger than natural sinks. So let’s say C is 500 GtC and D is 490 GtC. This would result in an increase by 10 GtC before human emissions are even added to the total, but the real increase is just 5 GtC. So what mechanism – that is not part of the 490 GtC sink – absorbs those 5 GtC of natural CO2 and 10 GtC from human emissions then? Do you see why C can be larger than D? What are you talking about? I don’t hate CO2. I just hate when people build their chain of arguments on wrong assumptions and don’t even realize it. You’ve written that you want to reach zero emissions (humans). Why? What would that accomplish? What would be the good that comes of that? That’s your reply to my comment? I see. What can’t be true gets ignored and instead you make up something else you can write about. Another red herring. I don’t want to reach zero emissions. It’s irrelevant what I want. When I comment I am trying to show you where you are making mistakes and possibly base your whole chain of arguments on these errors. Oh. So what is the point of extolling wind and solar? What do you want to reach? What will switching over from fossil fuels to wind and solar accomplish? What good will come of it? It will result in a reduction of CO2 emissions to a level that can be sustainable. Increasing emissions by 1-2% each year to cover increasing energy consumption isn’t sustainable. Using up fossil fuels isn’t sustainable. Sustainable for what? What is it that cannot be sustained, and why? Are you saying we don’t have enough natural gas, coal, or oil to burn? New supplies are found routinely. What will happen if we start to increase emissions again (emissions have been flat for 4 straight years)? Be specific. What are the consequences? I just hate when people build their chain of arguments on wrong assumptions and don’t even realize it. You must REALLY hate yourself. then. But that has been obvious from the start. Your whole CO2 hating mantra based on unprovable assumption. Yet still you have that baseless irrational hatred of CO2. And that hatred drives your whole life and causes you to waste your time typing baseless anti-CO2, anti-science AGW dribble on realist forums. If it wasn’t so much fun to keep you yapping mindlessly about that CO2-hatred, it would be tragic. says seb, the fabricator of fallacious physics. You have constantly PROVEN that your knowledge of physics and science is pretty much at the bottom of the sewer. You can’t even produce any science to prove the most basic FALLACY of your baseless AGW religion..
being that CO2 causes warming of oceans or of a convective atmosphere. Your AGW “belief” is SCIENCE FREE.. just like you are, seb. You never did give an answer to that question about drawback of enhance atmospheric CO2. You are just an EMPTY sack of yap. !! You should have declared your IGNORANCE ages ago, seb. There is still time to get back to reality, and realise that you actually don’t know much about anything at all. So sad.. so seb… so GULLIBLE !! You have produce ZERO provable science. MY climatic play – It is very low solar and as a result an increase in albedo /lower sea surface temperatures which will bring about global cooling from here. In addition look for a equator ward shift of all the climatic zones as the polar vortex should weaken and expand due to very low solar activity.